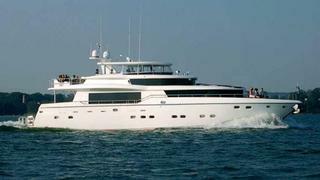 Natalia Hortynski at Gilman Yachts sends word of a further $300,000 price cut on Jeff Stanley's listing, the 2005 25m Johnson motor yacht 4 MAL. Special attributes of this yacht include a country kitchen arrangement on the main deck forward offering great views via the wrap around dark tinted windows, and a huge entertaining flybridge rivaling those of 30m yachts due to the fact her tender is stored in a garage below. Below decks is a centerline king-size master suite with his and her heads, a VIP suite forward and a double single cabin, each en-suite. Crew for up to four are accommodated aft in quarters that include their own galley and lounge, unusual for a yacht of this size. Power is provided by twin Caterpillar C-32 engines still under an extended service contract. 4 MAL is now down from $2,795,000 to $2,495,000.